For Mother’s Day. This Saturday. A trip through the gardens surrounding the Conservancy Farm, with all the gardeners to show off their handiwork. It may not be a proper cuppa, but still. This event, in its third year, keeps getting bigger. The flowers are in full bloom all over the gardens. Master gardeners will be there, helping you with your questions and selling some plants. 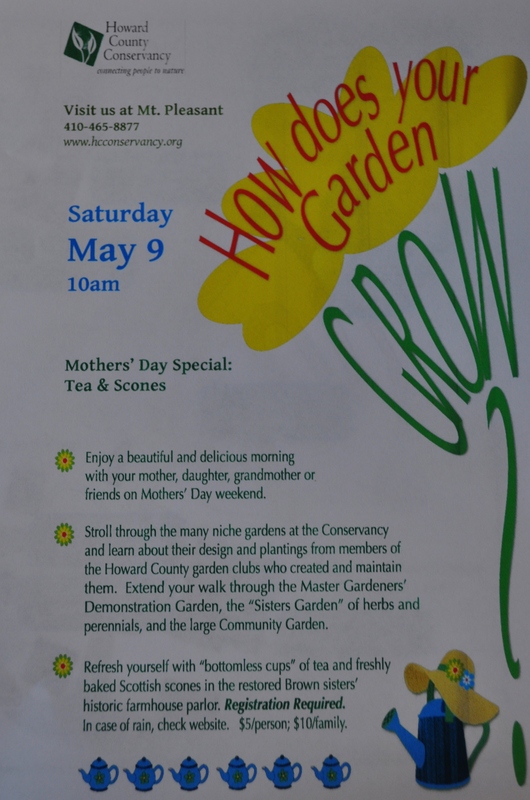 The community gardeners will be there, talking about what we grow, and how. 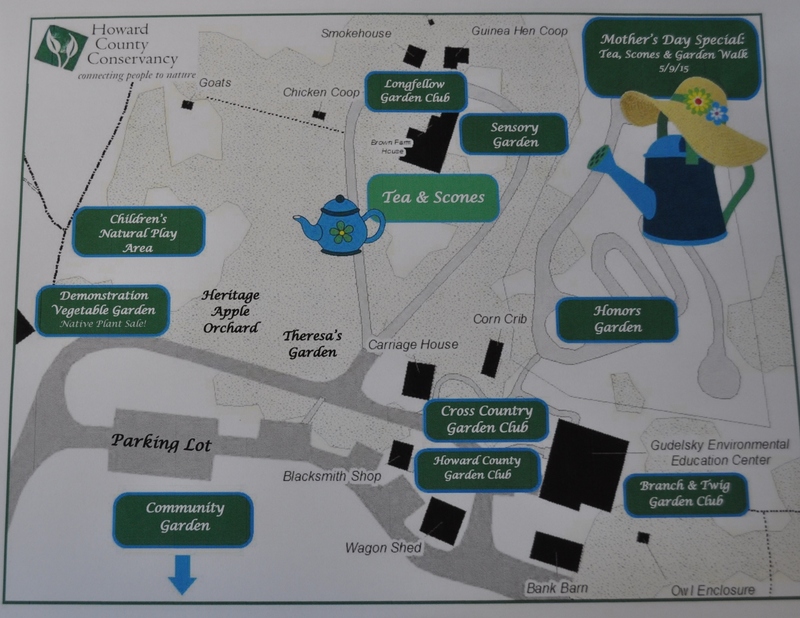 Those clubs that maintain all the other lovely gardens surrounding the historic farm will also be there. Come with mom. With friends. With your friend’s mom. Here’s all the sites that are open. You can preregister online here. I am baking scones. Two kinds. I am also hosting up at the community gardens. Talking mostly about our food bank plots. The event starts at 10 am. 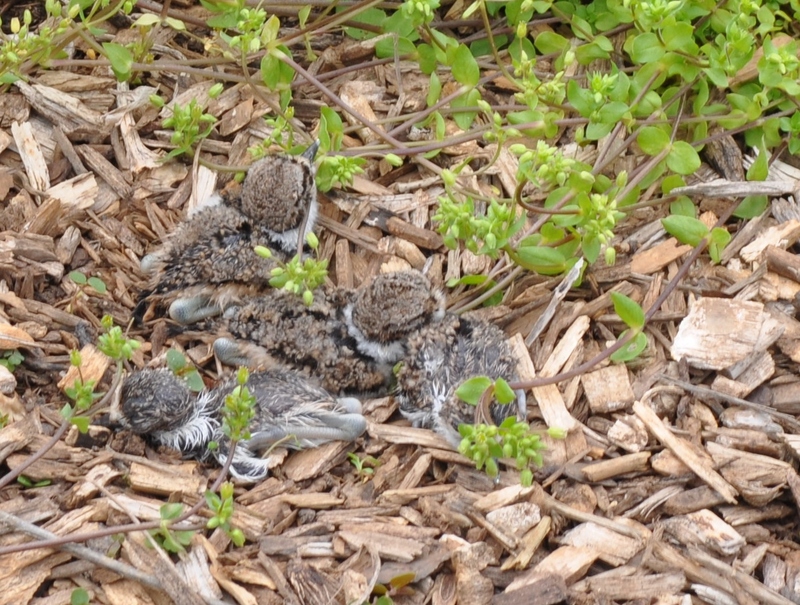 If you are lucky you can watch the baby killdeer chase after momma and poppa. They hatched Tuesday and are now running all over the place. Posted in Birds, Gardening, Howard County, Nature, Volunteering and tagged birds, gardening, howard county conservancy, nature, volunteering. Bookmark the permalink.